There are some things in this life that are hard to describe unless they are witnessed firsthand. I have been a nurse for almost 19 years and have witnessed some of life’s most amazing and devastating moments. I would like to share with you one of those moments today that has been ingrained forever in my heart. Here was a man (probably of Russian descent) whom I’ve never met before, embracing and proclaiming me to be his sister in Christ before he even knew my name. What’s so amazing about this moment, it didn’t matter this man could barely speak English. It didn’t matter he didn’t know my name—he didn’t need to. He only needed to know that I loved and accepted Jesus as my Savior. We didn’t need to speak the same language to understand God’s love for us. God’s love is the language the blind can see and the deaf can hear. This man showed me it doesn’t matter if we are Catholic, Greek or Jewish. When we accept the love of Jesus, we become the same lineage, united by the blood of Christ which makes us brothers and sisters. In God’s love, there are no orphans left behind. It doesn’t matter if we came from a broken home, a perfect home or don’t have a home. The love of Jesus provides a home for everyone– his love is our home. We are all apart of God’s one big family when we accept Christ as our Lord and Savior, adopted by the blood of Christ. Once we are adopted into God’s family, we become new citizens not of this world but of heaven. God’s love is what transforms our hearts and our lives. My patient recognized I was a part of his family that day because I was wearing my cross. What if I wasn’t wearing my cross? How would others recognize we are apart of the same family? Watching the news, there is so much division and hard to tell who is apart of God’s family because of our differences. Even in our differences, God’s love is what unites us. His grace is what saves us. When Christ lives in us, his loving kindness overflows from within us, allowing others to see the love of Jesus. When we give the lovingkindness of God, others will know how much God loves them and in Christ, we are all apart of God’s holy family. There is no greater love than the love of Jesus. God could have lived anywhere in the world but he chose to live in our hearts! (author unknown). You are loved my sister (or brother)! Are you apart of God’s one big family? How can we show others we are apart of God’s family? Nothing unites us and draws us closer to God than when we read scripture together! It’s not too late! 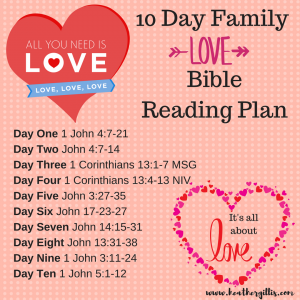 Join the Bible reading plan. Want to tell others how much God loves them? 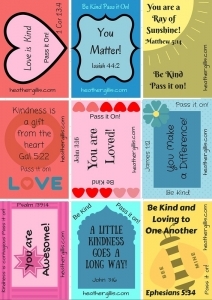 Click Here For Free Valentine Printable Cards with Bible Verses! Did you enjoy this blog post? Please share with others! Want more encouraging messages sent right to your inbox? Subscribe to my blog and receive a weekly Monday Message or like my Author Facebook page to catch the latest posts. Want to know more about being apart of God’s big family? Are you my brother or sister in Christ? Please introduce yourself, I would love to hear from you! Please Leave Your Comments Below. Have a Blessed Week! What Were The Most Powerful Words Ever Spoken? Do You Know What You Need? Heather loves to connect with other women and share the beautiful message of Jesus with others. Would like Heather to speak at your women's event? Just fill out the form by clicking here.